a) Over the years a number of crystal activity meters have been manufactured, the best known of which in the UK is probably the Type 193 or 193A which appeared during WWII and a series resonant test set by STC. 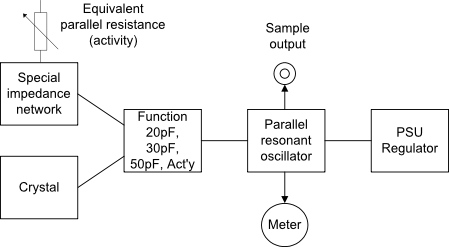 Shown below are typical block diagrams for both parallel and series resonant types. This unit was manufactured during WWII and is an extremely useful piece of test equipment if you make a lot of use of quartz crystals. It is designed to test parallel resonant crystals in the frequency range 1 - 10MHz with three different capacitive loads - 20pF, 30pF and 50pF - and also has a control to measure the crystal activity. It does operate over a wider frequency range but unfortunately not as low as 100KHz. The internal circuit consisted of an EF50 oscillator and a regulated 280v power supply which used an STV280/40 quadruple concentric gas regulator - now very rare and expensive. 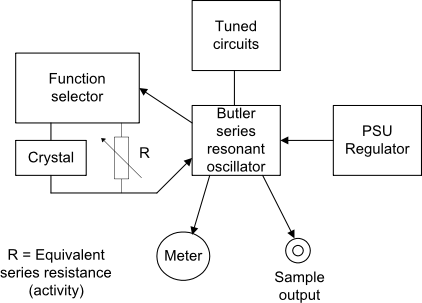 A sample output has been added to this unit to feed an external frequency counter. After demonstrating this unit at a recent amateur radio rally it fell off the trolley on the way out and the meter, a paper smoothing capacitor and the gas regulator valve were broken or failed so a new regulator circuit was installed using a pair of QS150/15 gas regulators, a new (electrolytic) capacitor and a new meter necessitating an adaptor plate. It is now back in operation. The military version of the manual for the Type 193 instrument may be downloaded from here.